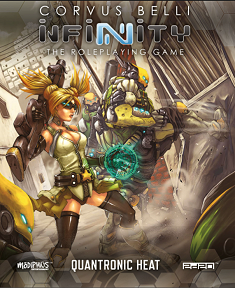 Quantronic Heat is a min-campaign of three interlinked scenarios. Publisher's blurb: "A cyber threat in the Human Sphere! Amid the glittering, skyscraper-studded city block arcologies of Neoterra the backbiting industrial espionage of the hypercorps has finally boiled over into open violence and murder. "When Bureau Noir agents are called in to investigate the shocking corporate raid, they quickly discover there's a deeper conspiracy in play. A terrorist splinter group pursues a mysterious scheme of quantronic brinkmanship which threatens the entire Human Sphere."